I have developed Superpowers. I am a shapeshifter. My Clark Kent glasses, long black coat and jeans appear in many forms in any given situation. shuffle my way through gothic indie shoe gazing nights – restricted movements built into the dance formations. I talk to Northern girls about ‘Prefab Sprout’ being the soundtrack to their lives. I am the butterfly chameleon trapped in a maze of interconnecting halls – with mirrored walls laced in kryptonite. I am looking, searching for synergy in the music. One hit wonders, ‘Doctor and the Medics’ piss-up their careers in front of me. No hit wonders, ‘The La’s’ break-down their careers in front of me. Old glam-rockers nobody remembers, ‘The Sweet’ detox their careers in front of me. I talk to Northern girls about ‘the Smiths’ being the soundtrack to their lives. I follow the loudest sonic vibrations through the crumbling Victorian architecture. All transformers, shapeshifting chameleons, have an original shape and colour when not trying to adapt. I walk the corridor, peel off my exterior, take of my glasses. Sita, is on the door, petite, slim, short cropped black hair, indian Psychology major. She recognises my chest logo. She lets me in. Money not required. The heaviness of the bass when the doors open makes my feet vibrate. Everybody’s moving to the beat – on the one. Wall-to-wall multicultural funkateers, jumping, unified, leaping in time. Busting moves wearing matching t-shirts. Why have a Superman S when you can have a powerful Lion, the Premier club symbol – and it is friday night. Premier Club night. bathed in synchronised red and white lights cutting up the darkness. I stretch. I let the funk take over my body – or am I just letting my soul out of its cage? I’m not the best dancer, not even in the top 50 – doesn’t matter. is popping, locking, freezing, throwing his hips and doing the splits on tables. 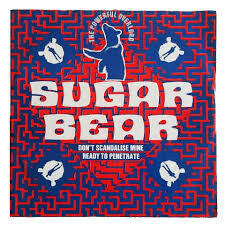 Sugar Bear’s underground rap hit ‘Don’t Scandalize mine’ (that samples talking heads once in a lifetime) is roaring from the speakers. The MCs point and yell out our names. taking over cramped kitchens, scaffolding, enclosed courtyards, nightclubs, houses. EPMD, Rob Base and DJ Ez Rock, Keith Sweat, Guy, Teddy Riley classics. I live on a diet of Jollof rice and New Jack Swing. I walk the street, red amber streetlights under the white sky. slow-jams and James Brown remixes fill my ears. All transformations have a price, a cost of entry. What if I am reflecting, what I’ve always been? How can I shuffle when I was born to dance? How can I be flapping fragile wings at 12 times a second when I can be grooving to high grade funk at 120 beats per minute? the essential Premier Club Soundtrack to my life. chatting on the mic, showing how it’s done. I tell everyone on Mondays through to Sundays, 7 days a week, about the people and the Premier Club Soundtrack to my life.